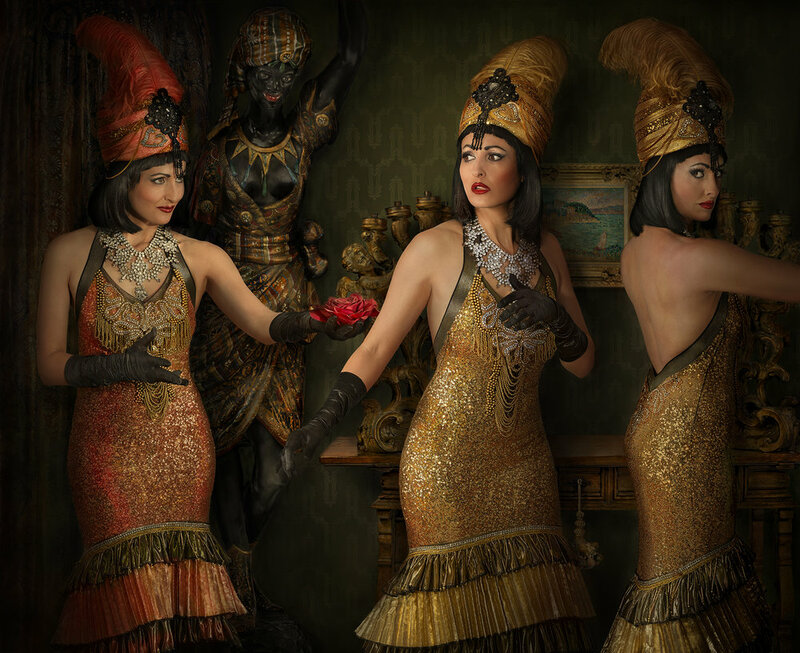 Femme Magnifique is a photographic series that portrays renowned burlesque performers through narrative art. The artists depicted in these works are performers who actively contribute to the vaudeville scene in Australia. Therefore, the aim of the works is not only to shed light on the burlesque industry but to reveal the artists who continue to cultivate this genre in Australia. For Daniel, the allure of burlesque is strongly influenced by the woman’s attitude and spirit. He argues that it is no coincidence that 80% of the burlesque audience is female; drawn to the theatricality, the performance and the strong visceral archetypes depicted in the themes and stories of each performer. Through shifting perspectives, Daniel’s works creates a sense of movement across time and space to capture elements of an evolving burlesque drama. By transitioning the performers from back to centre stage or in the midst of performance, the non-linear narrative deliberately creates mystery and dramatic tension. This offers an opportunity for a deeper engagement and interpretation of contemporary burlesque. The methodologies adopted for Femme Magnifique undergo multiple processes, although it always begins with a photo shoot. By combining a strong sense of colour, light, and composition, Daniel uses his digital artist skills to utilize colour pixels for painting and a camera to capture images that reflect various aspects of his subject matter. Daniel’s work endeavours to highlight the scene in Australia by offering viewers a glimpse into contemporary burlesque and the artistry behind the acts.